Babies are born with naturally weak neck muscles, which is why it's important to ensure that you support your baby's neck at all times. As your baby grows and develops, those neck muscles will become stronger, but you can complete neck exercises with your baby to help expedite the process. Making sure that your baby has strong neck muscles can prevent torticollis, a condition where the neck is turned to one side. Practice neck exercises with your baby to help aid in his development. Tummy time is recommended by pediatricians as a way to help your baby strengthen her weak neck muscles. The Ohio State University Medical Center notes that by placing your baby on her tummy for a few moments a day, you promote a stronger neck as she tries to lift her head from the ground. Lay a blanket down on the floor and get down with your baby so she doesn't become bored or frightened when you lay her on her tummy. Manually stretching your baby's neck while you're holding him can help strengthen the neck muscles. Babies naturally tend to prefer looking to one side, so you can gently turn your baby's head so that his chin touches his shoulder, according to the "Infant/Toddler Safe Sleep & SIDS Risk Reduction in Child Care Newsletter." Make sure you gently rotate the head, and never force your baby to turn his head; it could result in injury. The "football hold" is a popular way to breastfeed, but it can also help your baby strengthen her neck muscles when you use it in other ways. When you carry your baby around the house, position her body under your arm, with your hand firmly supporting her belly and chest. She should be facing downward, so she has to use her neck muscles to look around the room, therefore strengthening them as you carry her. A few brightly colored, noisy toys can capture your baby's attention, making them ideal for neck exercises. Lay your baby on a blanket on the floor, and then rattle the toy in front of him. Even if he is a very young newborn, he'll look toward the sound and look at the toy. While you shake the toy, switch to the other side of your baby so that he has to turn his head to find the sound again. 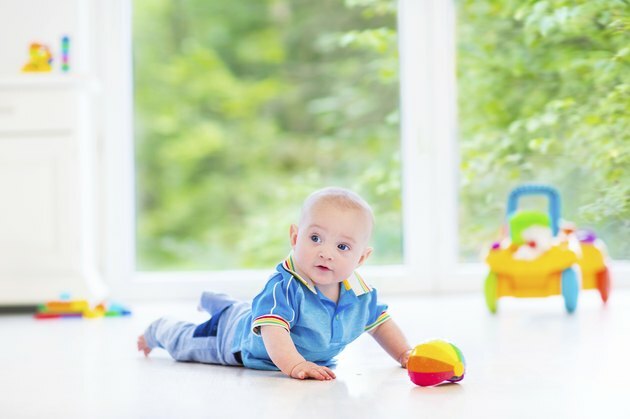 Parents Connect notes that you can switch toys if your baby seems bored to keep him engaged, interested and stretching his neck muscles.